Patrick Harper of the U.S. National Team, No. 21, skates against Sweden during the World Junior Hockey Championship earlier this year. A mystery illness shut down the Nashville Predators prospect not long after, and Harper isn’t revealing any specifics. One night later, Harper hit the ice once again, as his Boston University Terriers lost at home to Maine. Harper was sidelined after Jan. 6 due to a mysterious illness, one that kept him out of BU’s lineup for the final 20 games of the season. A highly rated prospect in the Preds organization, Harper was back in a team setting again last week in Nashville, as the Predators conducted their annual development camp. Nearly half a year after playing in his last competitive game, Harper says he’s healthy and looking forward to his junior year with the Terriers. What exactly it was that knocked Harper from the lineup remains unclear, but Harper says his symptoms began not long after returning from the World Junior Championship in Buffalo. Boston University coach David Quinn told media during the season that Harper was dealing with a respiratory issue, but Harper said last week that wasn’t accurate. Harper didn’t want to go into any further detail, choosing to focus on his current clean bill of health. That’s good news for Harper and the Predators, as the 2016 fifth-round draft pick has totaled 58 points (21 goals, 37 assists) in 58 games through his first two years of college. The Connecticut native will always have to prove he can succeed against bigger competition – he’s listed at 5-foot-9 and 160 pounds – but Predators director of player development Scott Nichol likes Harper’s potential. Nichol knows all about competing against bigger opponents, as he played in 662 NHL games – including four seasons with the Predators – despite the fact he measures 5-9 and 180 pounds. “I think the way that little guy is wired, he’s going to play in the NHL,” Nichol says of Harper. “He’s going to be successful. He’s got great skill. He’s smooth, he competes, he’s a student of the game, he asks you questions. 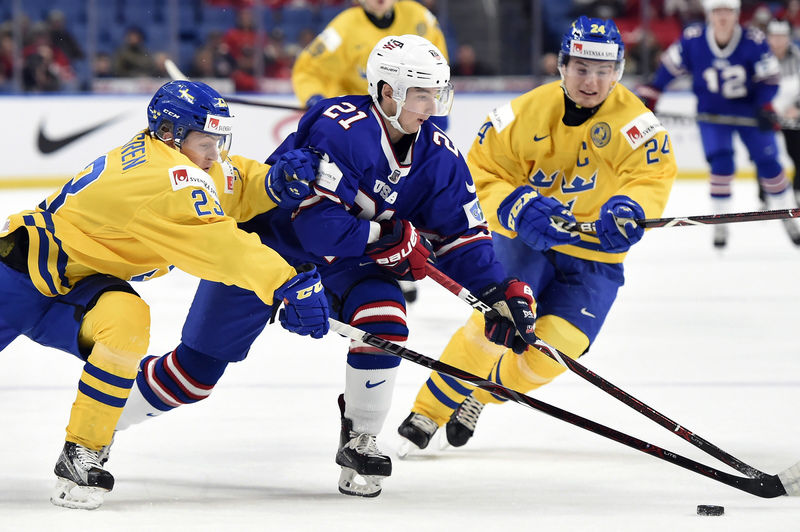 Harper gave a glimpse of his talent at the World Junior Championship, when he posted two goals and two assists for the U.S. while competing against plenty of future NHL players. He was also leading Boston University with 21 points (eight goals, 13 assists) in 20 games when his season came to an end. So needless to say, Terriers teammate – and fellow Preds prospect – Dante Fabbro will be eager to see him return to the lineup this year. “Obviously, it was pretty scary when we had heard about what had happened to him,” Fabbro says of Harper’s illness. “He’s one of the healthiest kids I know with training and his diet, so it just kind of put things in perspective – a lot of things can happen to good people. The team’s first-round draft pick in 2016, Fabbro has chosen to head back to Boston University for his junior season instead of turning pro. If Fabbro was to stay in college for all four years without signing a pro contract, he could become an unrestricted free agent, an outcome the Predators experienced when forward Jimmy Vesey went that route – spurning Nashville for the New York Rangers. But Fabbro’s current plan is to sign with the Predators after his junior season. “Personally, I just felt that one more year (in college) might be beneficial for me,” Fabbro points out. “At the same time, (Nashville) is the place I want to play. I grew up loving this team. Fabbro adds he understands why Preds fans might feel he could head down the same path as Vesey. But even though Fabbro can’t 100 percent guarantee he’ll sign here, he already has ties to Middle Tennessee. Two of Fabbro’s sisters attended Austin Peay. “Nashville is such a great city – it’s growing so much and the passion for hockey down here is absolutely incredible,” Fabbro says. “I got to see Game 5 here against Winnipeg (in the second round of the playoffs), and when they were doing that opening ceremony before the players came out, it honestly gave me chills. Fabbro had a good sophomore season at Boston University, totaling 29 points (nine goals, 20 assists) in 38 games. He said he wants to work on his footspeed and his strength in the coming year. The Preds’ first-round pick in 2017, Tolvanen had an incredible year’s worth of experience, competing in Russia’s KHL, the World Junior Championship, the Winter Olympics, the NHL and the World Championship. He didn’t make an impact in three games with the Predators near the end of the season, but it has to be kept in mind that the highly skilled Tolvanen is still just 19-years-old. The Finnish native was actually one of the youngest prospects at the Predators’ development camp last week. Tolvanen spent several weeks with the Predators at the end of the regular season and through the playoffs, and even though he couldn’t work his way into a stacked lineup, Tolvanen says the time spent here was beneficial. “I think I gained confidence coming back for next year because I know all the players, coaching staff, training staff, all the people around the rink and the Preds,” Tolvanen adds. “I think that was a big thing, and it just kind of gave me a jump on the game system and so now I know those things, too. Tolvanen, who set a KHL record for points (36) by a player under the age of 20, knows what he wants to work on as he prepares for training camp.